Do you ever find yourself in a situation where by you realise that you are witnessing something truly wonderful but not as the situation originally intended? For example, being at a birthday party of someone else's 100 year old Grandma. You can enjoy the experience of the party, everyone loves a party, but the thing you enjoy the most is the joy of everyone else there. The tender smiles, the laughter shared by multiple generations, the reminiscing over memories that aren't yours. I had one of these rare and beautiful moments very recently at a concert. Mr M and I found ourselves going to see The Overtones at The Nottingham Royal Concert Hall last Wednesday (That's right; a concert, on a school night!). As we sat down and waited for the show to begin I will admit now that I was slightly apprehensive of what was about to come. I had been talking to some of my work colleagues about the group, colleagues who hadn't heard of them before, and they basically made me think that we were about to attend a concert at which we would be the youngest people there....by some generations. To a certain degree I didn't care if we were the youngest folk there; I like the group, I love the music, and I would rather pay to see a group that can sing phenomenally than one that mimes or has to stop for a break every ten minutes. But, I would be lying if I said that I was head over heels at the idea of going - although a large factor of this may be due to the fact that I was concerned that it was going to be a late night (I'm normally in my pyjamas by 7.30pm)! Just goes to show kids, age is a number! Quite honestly with this as my attitude I was the oldest person there by far! Any concerns I had were soon pushed aside when a couple roughly our age sat right next to us and I realised that I was being a grumpy arse. Before long the show started and the crowd were immediately up on their feet. It was at this point that I felt as though I was a welcome guest at someone else's family party. It literally only took one song for the crowd to be in full swing, or so I thought. It was when Run Around Sue (a Dion classic) came on that I really began to realise what this group were about. Up until this point their singing had been impeccable, the dancing synchronized, and everything was timed to perfection, but this song really meant something. It had people up and dancing, I mean properly dancing. There was a couple behind us, middle aged I'd say, who broke out into full on jiving. They were giving it everything that they had, the looks on their faces were the most fantastic I have seen in a while. The love for each other, the love for the music, the simplest joy just emitted from them and it was infectious. Throughout the night there was a elderly gentleman who did not sit down. From the first note to the last he was on his feet dancing like he was 18. I spent most of my night watching him. It was inspiring to watch. It was as if the music had given him a fresh breath of life. You could see by the way he stood that he was in pain but that was not stopping him. Not far behind him there was a steward that caught my eye, you know the ones that are supposed to stand there and look seriously around the crowd to ensure there was no trouble? Yeah, she was dancing. Then there was the Dad and Daughter that sat beside us. It appeared as though it was the stereotypical Dad/Daughter relationship; she spent the entire time on her mobile whilst he tried to coax conversation out of her with "Dad" questions like, "what did you do at school today?" and comments along the lines of "you can't have a boyfriend until you're 75...and a half!". Once the music started that was it, they were Dad-dancing together and singing along. It was brilliant. I could go on all day about the way the music had the crowd but I kind of want to keep some of it to myself - in an entirely selfish way. Going to that concert was the best thing I have done in a while. The joy and unity that I witnessed was absolutely beautiful. I took so much from seeing so many people having such a good time. It was a humbling moment and I suddenly felt very content. 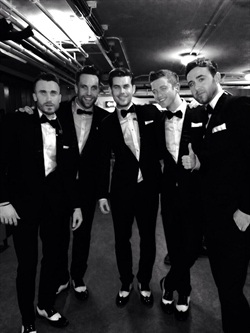 The Overtones and the band were excellent. It is such a rarity to hear genuinely talented singers now but, my word, can these boys sing! They striped it right back at one point and went Acapella. Ooof! It was a truly fantastic night and I am glad I went. Sometimes life throws you a curve ball and you sit wondering why but embracing one of those "why" moments really can make you see things from a different perspective. I was part of something really special on that dreary mid week night. 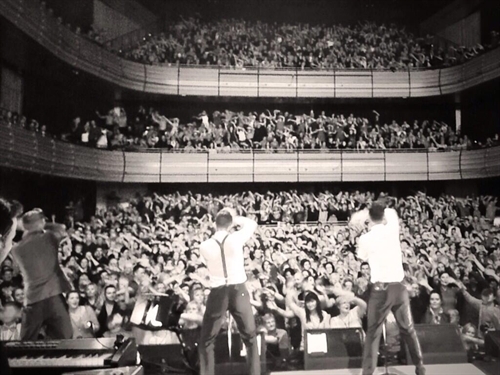 The singing, the music all of that helped but the truth of it is; the magic was in the crowd that night. 2. The Bare Necessities (go and listen....Lachie's voice is like thick caramel!.......I'm going to go and compose myself.......) never leaves your head. Never. Well, What do you think about Spat?